A HUGE Thank you to all who attended our Spring Kick Off Breakfast! Andrew Hoseby, Jay Dahlstrom, Josh Stephan, Paul & Rhonda Oehme, Dan Leary, Chris Homeister, Mike Stone, Troy Mason, Johnathan Chapman & Keri Vanderwerff - Have Fun all!! www.minnetonkadiamondclub.org - then click on Mulch Sale - Click on which of the 3 colors you would like to order (25 bag minimum order) - Click on “Add to Cart” when done ordering - Click on the Cart in upper right hand corner - Click on Checkout and proceed with your personal information to complete your order. 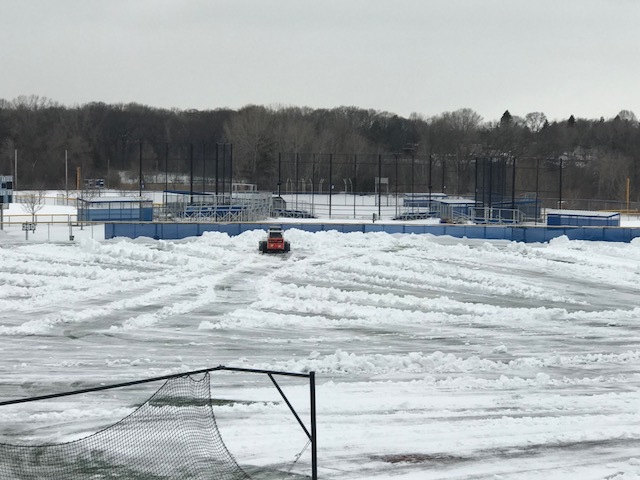 While baseball teams across the state spent March and much of April cooped up in gymnasiums and inflatable domes, Minnetonka had the luxury of getting outside to practice and play games. The Skippers, one of the state’s top Class 4A programs, call Veterans Field home. 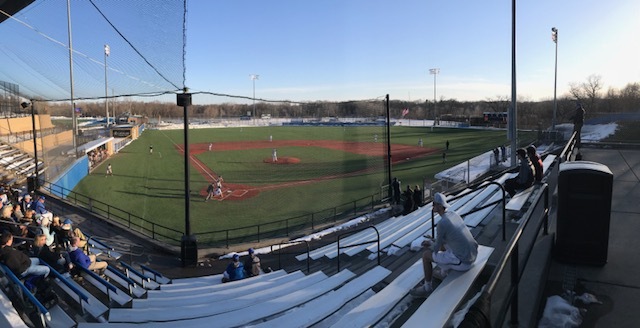 Built in 2007, it was Minnesota’s first all-turf baseball stadium, which made it usable when other teams were gazing at snowdrifts on their ballfields. 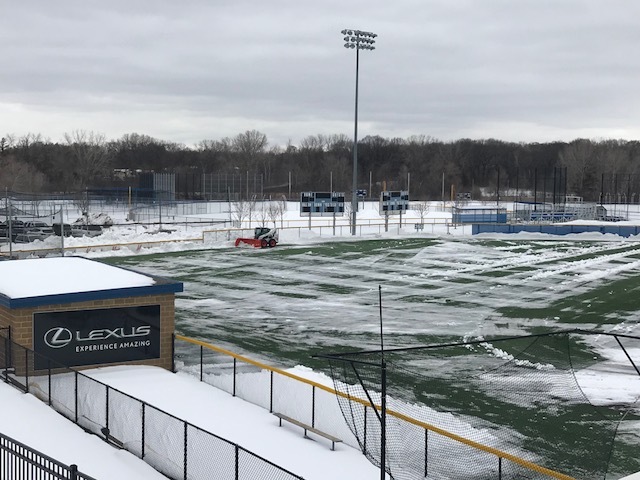 Except for a few days in the aftermath of snowstorms, Minnetonka has been practicing outside since late March. It’s one of the few teams that has been able to play most of its games. Through Tuesday, the Skippers had played five games, all at home, posting a 4-1 record. When they hosted Anoka for a scrimmage Monday, it was the first time the Tornadoes had been outdoors this spring. Senior lefthander Nick Lommen, the Skippers’ No. 1 starter, said getting the opportunity to train outside has been invaluable. Minnetonka is a program that rarely wants for talent. The 2017 Skippers graduated 17 seniors, 13 of whom have gone on to play college baseball. While the current group may not have the top-end performers of a year ago, when seven players went Division I, the Skippers are certainly skilled. What they lack is varsity experience, as many of them played on the JV team a year ago. Not having to wait for better weather has hastened their development. Lommen, one of the few varsity holdovers from a year ago, has been playing with this group for the better part of five years. He says the current Skippers have an intangible that was lacking in previous teams. Senior Mason Nadolney, a captain alongside Lommen and Wandersee, pointed to an incident early in the season that illustrated the resolve of the current team. 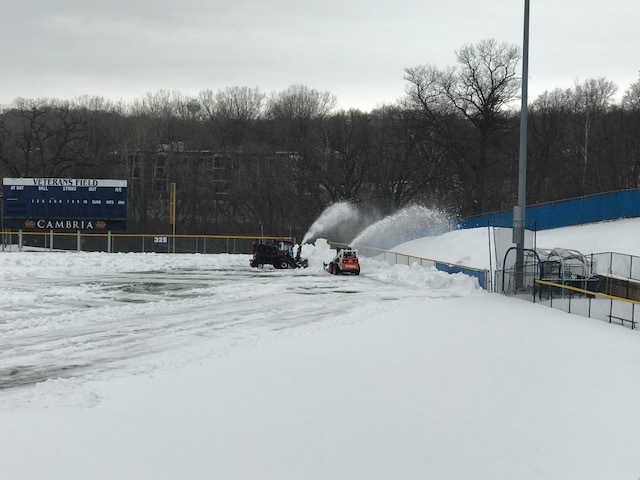 Minnetonka High School staff removes the snow from Veteran's Field during the third week in April so the baseball team can play ball! Thank you to all those who attended the Spring Kick-Off Breakfast! We raised over $10,000 that will help pay off the note on Veterans and Legacy Fields.